Summary: Ebola is a rare and deadly disease that kills between 255 to 90% of the people it infects. Symptoms usually begin with a sudden influenza-like stage characterized by feeling tired, fever, pain in the muscles and joints, headache, and sore throat. Ebola is a rare and deadly disease that kills between 255 to 90% of the people it infects. It is originally carried by the African fruit bats and has then spread to other animals and now humans. The first reported case of Ebola in a human was in 1976 in Sudan. From then, Ebola has continued to spread in small sporadic outburst. However, the biggest outbreak of Ebola is the 2014 Outbreak in West Africa. While this outbreak is centered in Guinea, Sierra Leone and Liberia, there have been cases that have spread across borders to as far as the United States of America and Europe. 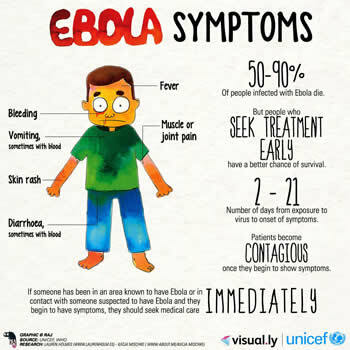 While the chances of contracting Ebola if quite less outside of the three centered countries, it is best to know the symptoms of the disease just in case.